Yamaha (portable) P series is incredibly famous for their superior quality, sufficient connectivity, and control features. Among these is Yamaha P-115, a digital piano with fully-weighted 88 keys and many other impressive features. This piano is an ideal match for those looking to perform on stage especially if you are looking to coordinate with other players without trying to forcing to complex features. Apart from using it in a concert, there are a lot more places that you can use the piano. 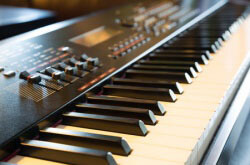 However, for the purpose of the Yamaha P-115 review, we will go straight to its specifications. Yamaha P-115 is equipped with Pure CF sound engine that is commonly used in the Yamaha P-225 the first piano in the P-line. The pure CF sounds comprise of the 001 grand piano found in the Yamaha CFIIIS 9’ concert Grand recorded in multiple volume levels for each note. The grand piano produces exceptionally clear and realistic sound with a beautiful resonance and decay. With the combination, P-115 delivers sound that is very convincing and more vibrant especially if you compare it to the previous model P-105. The sound produced can be even better especially when you listen on a pair of quality headphones. In addition to that, 14 other present instrument voice options sound really authentic. This includes three grand pianos, three organs, three electric pianos, Vibraphone, Strings, Harpsichord and Wood bass. There is also reverberation sound effect that makes the P-115 sound more significant and expressive, stimulating the acoustic environment. The reverb comes in for types; concert hall, recital hall, club and chamber that you can easily choose and adjust on the keyboard. 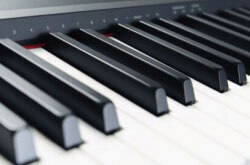 Yamaha entry-level digital pianos come with Graded Hammer Standard (GHS) keyboard actions that are well balanced and fully weighted giving the user a natural keyboard feel. This is the similar case with Yamaha P-115. It comes with 88 weighted keys that are heavy on the low end and lighter in the high end. The piano keys are touch sensitive making it able to produce different sound variation relative to how hard you touch the keys. You can also adjust the touch level to what suits your playing style better. This preset comes in four settings: fixed, hard, medium (default) and soft. When you select the fixed setting, you lock the touch sensitivity, and the piano produces the same volume no matter how hard or soft you strike the keys. The hard settings produce a dynamic range from softest pianissimo to the booming fortissimo and allow the aggressiveness of the player. The harder you strike the keys, the louder the sound produced, so you must press the keys very hard for you to create the most booming sound. The medium settings (default) give the most natural feel, close to that of an acoustic piano. The P-115 keys are made of plastic and don’t have the ebony or Ivory key tops like some of high-end Yamaha digital pianos. However, the black keys have matte finish to prevent fingers from slipping when you become moist. The piano is perfect for any aspiring pianist who needs the feel of a grand piano. Its touch is like that of an acoustic piano and encourages proper finger technique. The Yamaha P-115 piano has a compact design that almost looks the same to that of P-45. Without a stand, it is 52.2 inches long, 11.6 wide and 6.4 inches high. The piano can be fit easily into a small room because it doesn’t take too much floor space. Even better, you can place it on a desk to connect to a computer, but it is more convenient if you have a dedicated stand to place it on (looks great on it too). You have to buy a stand because Yamaha P-115 does not come with any when you buy. You can buy the X-type stand but if you want a better look, go for the Yamaha furniture stand for the P-115 model. Apart from it being compatible, Yamaha P-115 is pretty lightweight (weighing 26lbs) making it easy to be carried along by anyone. It’s also easy to store when not in use especially if you have kids or pets that might accidentally drop it when playing. Yamaha P-115 consist of two speaker system with 7W + 7W amplifiers. The speakers sound good especially when you consider their size and the power of their amps. The speakers convey rich low-frequency and bright, crisp high tones that are brought by combining with the tweeters, therefore, producing a well-balanced sound. These speakers are sufficient for home usage or performances in front of a small congregation. They can easily be boosted by connecting them piano to an amplifier or a PA system to acquire a more powerful sound. You can also choose whether to shut off the speakers on the keyboard when you connect it to an amplifier or external speakers. The polyphony count means the number of notes a piano can produce at one time. If a digital piano has a high polyphony, it means that the keyboard can provide a sound close to that of an acoustic piano. The P-115 has hugely improved on this especially when you compare it with the prior version P-105. It has a polyphony count of 192 keys when the older one has 128 key polyphony. The piano also has an increased instrument sound selection and rhythms making it more convenient for players. With the high polyphony count, the piano gives an enormous deep tone across all the keyboard voices. The piano has a sounder damper resonance response, therefore allowing a more elegant and natural tone when paying. 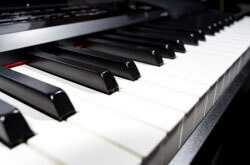 The keynotes of the piano are sufficient for any player to create a multi-track recording and layer multiple sounds without running out of memory. There are several features that P-115 has that make its playing and learning comfortable and more enjoyable. In this Yamaha P-115 review, we will take a look on features like mode, music library, recording, and playback along with others. The P-115 piano has 3 modes available: Split, Dual and Duo. Split mode divides the piano keyboard into two, whereby, you can play a different instrument in each section. You can also change the splitting point on the keyboard. The dual mode helps the player to layer two instrument and sound simultaneous across the keyboard range. The duo mode separates the piano into two where each half has the same pitch range. Here the keyboard can be played by two players side by side and play the same note at the same time. This mode assists in learning where a teacher can play side by side with the students. Like many digital pianos, the P-115 does not need any tuning, though you can adjust the pitch on the keyboard using the transpose and tuning functions. The transpose functions allow the users to adjust the keyboard in semitone steps. For example, if you are playing a song in F major, you can change the pitch to play it in the C major without learning it in new keys. You can also match the tune of a piano by fine-tuning the pitch. These are all great futures that greatly aid the playing. Unfortunately, the piano lacks the feature to adjust the standards of other tuning systems like meantone, pure major, pure minor, etc. The P-115 has a recorder that allows the players to record their playing and store them in SMF format. The recorded data can be modified (change the instrument sound, tempo or even add a new note) after the recording. Despite the lack of audio recorder in the piano, you can record any audio sound on your computer and play them. The P-115 comes with an inbuilt music library that consists of 50 preset songs. You can playback the songs, practice when the songs are playing, change the tempo, tone and more. You can also download other songs from the internet and load them to the piano using a USB and use them as the preset songs. Unfortunately, the memory of the piano to record or store the downloaded music is limited and can allow you to save only one external data either the downloaded or recorded. The P-115 has this accompaniment function that assists any pianist looking to challenge themselves when it comes to playing different types of music. This function gives you the sound like you are playing a duet when instead he is playing on your own. This is a great way to practice for a duet, especially when the other person of the duo is not present. The player can play the “left hand only” chords, and the feature will take care of the rest. 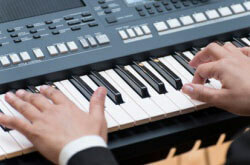 The functions can play ten different styles including blues, boogie, swing, rag, arpeggio, slow rock along with others. The metronome function helps in keeping an accurate rhythm and can also be used in fundamental skills such as timekeeping. The P-115 allows you to change the metronome to one of the inbuilt rhythms including the Jazz Waltz, Disco, Samba, Swing, Latin Pop, etc. Yamaha P-115 can boost the sound and increase the volume making the soft played tones clearly audible. This feature helps in cutting through an ensemble of instruments during a performance. This function helps in adjusting the sound quality to produce a more balanced and clear sound especially when the high and low frequencies aren’t clearly heard. There are other functions like auto power off control that assist the Yamaha P-115 to be an instrument that you would like to put your hands on. However, we have touched the most important ones in this post, and it would not be a complete Yamaha P-115 review if we do not take a look at the pros and cons of the piano. Just like other top digital pianos that are designed to produce a realistic acoustic experience, the P-115 does it quite well. For well under $1000 you get a very good digital piano. It is a versatile instrument and can be used in diverse settings and proves to be a great piano not only to a beginner but also to the experienced. 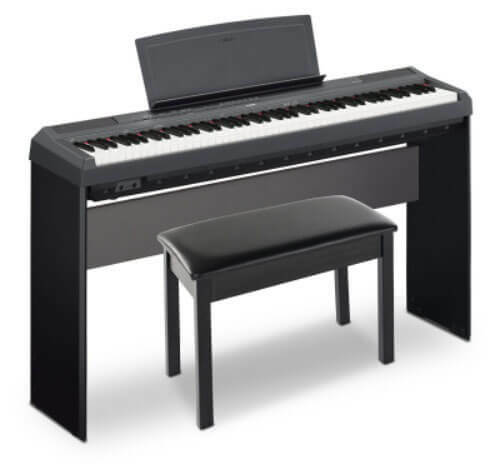 Unlike many other Yamaha P-115 reviews, I would advise you to go for it especially if you are not sure of what to buy because it is less expensive piano that sounds well when they get on the stage.